These are intended to be dirt cheap, prototype boards. We use them for all our stuff and never have problems. If you hate them we'll refund your money. If there's a problem with the board, we'll replace it or refund your money. While this site is founded on the "Dirty" concept, it's not so dirty any more. Our original "dirty board" was part of the fab's test of digital silk printing. Since that brief one week test, all silkscreens are applied by hand using an actual screen. The results are beautiful. Our cheapest option is a "Protopack" with +/-10 PCBs. You almost always get more than 10 boards. However, very rarely orders are short 1 (~0.5%) or 2 (~0.1%) PCBs. The board house is cheap and dirty, and refuses to do anything about these orders. The only solution is to use another, much more expensive, board house. If you MUST have 10 PCBs please choose the '10' options at double the price. 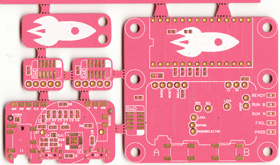 If you don't mind an amazing deal on 9-12 PCBs the "Protopack" is perfect. World wide shipping is included! Really! Yes, it seems unfair to pay for a 10x10cm package if all you want is a 5x6cm PCB. There are board houses that will charge by the square cm, but we think you'll find them even more expensive! Please note: only one separate design is allowed in each order. Panelized designs are OK for 2 layer boards only, but the boards must be connected by tabs (mouse bites and slots) that snap apart later! Separate, non-connected boards will be refused by the board house! This site is an experiment. We're learning that PCBs are freaking expensive to ship (heavy), so we are adjusting the price based on average order weight as time goes on. Help! I made a mistake! You may submit updated/corrected gerber files AND change board properties like color until the second we send your boards to the manufacturer! If your order status is Order received or Problem visit the status page, click 'Edit', and upload updated files as many times as you need. If you choose new properties that change the price of the board, simply hit the 'Pay Balance" button to pay the difference. For best results don't torture the board house! Be conservative. After all, these are crappy PCBs! Currently we provide stainless steel stencils with or without a frame. Steel stencils are 13cm x 15cm, or bigger if needed. Framed stencils are 47cm x 37cm x 2cm (46grams). Stencils are 0.13mm thick. Framed stencils are hell to ship, and the price/shipping reflects this! Stencils are made using the top and bottom solder mask layers (GTS, GBS). The board house makes stencils for Chinese production lines using a custom method processing of the solder mask layer. There is no other option. Most board houses in China offer an expedited 48 hour (rush) and 24 hour (emergency) service ON PROTOTYPE QUANTITIES and expedited service on larger quantities. Rush/emergency boards are sent to the board house every hour, on the hour 10:00 to 17:00 China time, Monday to Saturday. Currently it is Wednesday 10:58 in China. This is best effort and NOT guaranteed! Processing time is only the board house processing time and does not include Sundays! Your order must still ship to us and then we have to ship it to you! This can add 1-2days to processing time. Protopacks (quantity +/-10) are the only option eligible for a true 48 hour (rush) and 24 hour (emergency) service! Larger quantities will be expedited if you choose rush or emergency, but not to the extent of a protopack. 4 layer PCBs only: you cannot combine rush service and color/ENIG for 4 layer boards. V-groove cutting machine, see it in action on YouTube. This machine makes a V shaped cut about half way through the PCB material so they are easy to snap apart later. Minimum cut length is 8cm due to the v-goove machine cutting bed size, that means a 5x5cm PCB protopack can never have V-Groove. Make your V-groove at least 8cm long so uncle doesn't lose a finger! May be available in the advanced options of the PCB order form for an additional charge. May not. V-groove is specified on the outline layer. We accept the most common PCB files: RS-274X Gerber files. Please be sure they have the correct file extensions shown below and put them in a ZIP archive. Use our gerber generator at your own risk! Please note: the automatic Eagle .brd processor does not currently work with 4 layer boards! These layers/files are typically needed to manufacturer a complete PCB. Only the Board Outline (GML/GKO/GBR) is required. For 4 layer PCBs the inner copper is generally .G1 and .G2. For inner plane layers .GP1 and .GP2. Multiple outlines: if you include multiple board outlines in your file, the industry standard dictates that the SMALLEST OUTLINE will be used. Click "Layer Report" in the cart for an annotated analysis of your board files. This can help spot missing layers and has help for common problems. Be sure to check out your Gerbers before submitting them. The factory will tell us if something is crazy, but at these prices we're not checking. Here's some utilities you can use. Your Gerbers will be sent to the factory on Monday, Wednesday, and Friday at 10:00am China time. Currently it is Wednesday 10:58 in China. There's no point in doing it sooner because they'll just queue them at the factory... Rush orders are pushed hourly, on the hour. DRU rule check and CAM Gerber export files for newer Cadsoft Eagle v7.2.0+. Cadsoft changed the CAM command for drill export in v7.2.0. If your drill layer seems 10-100x bigger than your PCB layers be sure you're using this CAM with Eagle v7.2.0 and newer. The DRU is unchanged. DRU rule check and CAM Gerber export files for Cadsoft Eagle v5 - v7.1 are available below. Be sure to use only with Eagle v7.1 or older. DRU rule check and CAM Gerber export files for Cadsoft Eagle are available above. We add some crap to your boards! The board house will add three tiny numbers to your board: batch ID, a customer number, and our PCB ID. This is so everyone knows which crappy PCBs to send you. No, we won't put them on a specific side or location. Don't like it? Tough. Buy an entire panel somewhere else. Get the hell out of here. We are an automated conduit to cheap local Chinese fabs. We don't read squat, and at these prices you'd be insane to think we do! Nobody at the board house even speaks English! You need a much more expensive board house if you need this level of service. Payment is by PayPal Express Checkout. You may use your PayPal account or a credit card. Paypal makes it really hard to see the credit card option, or it may be disabled for your location. Free shipping. Previously shipping was included in the price of PCB 'protopacks', but now it's charged separately. Don't worry! The overall cost of your order will always be less than the "free shipping" scheme. Have a design you want to share or sell, but don't want to keep stock, print labels, stuff envelopes, and walk to the post office? Share your board in our store and get $1 of Dirty Credit or cash for each order. On the order status page click the 'Share/Sell' link and your PCB will be available immediately to all our filthy customers. Add a description and photos, become part of our sleazy affiliate scheme. Credit can be used anytime, cash payouts are made by Paypal at a balance of $10 or more. Please check 8.0x10.0cm too big for 5x5cm PCB order (ignore if you are sure): PCB is bigger than purchased size. Maximum board length and width must be equal to or less than the ordered length and width. Even one mm bigger than the ordered size is TOO LARGE and your order will be canceled or delayed.Please note that Protopacks are sold by maximum length and width dimension, not area. A 2x7cm PCB fits a 10x10cm Protopack, it does not fit a 5x5cm Protopack. Our measurement script can be thrown off by a lot of things like components or text outside the PCB, especially on the board outline layer. If you're sure the board fits in the size purchased you may ignore this warning. We just run the site and support. A fulfillment team at Flylin.co processes and ships the orders. Get in touch with them for order fulfillment, small assembly, and the general getting of stuff done in China. Yes, you may panelize 2 layer boards! It's amazing, we know. The different designs must be connected with breakable tabs (slots and mouse bites) large enough to survive production. Wimpy little tabs and tight routing between boards will be refused. Separate, non-connected boards will be refused by the board house! Very rarely the board house may separate panelized boards or make modifications to the panel to make it testable or manufacture-able. This is just a fact of free PCB panelizing on low volume orders - take it or leave it. The 4 layer board house isn't so dirty and WILL NOT accept panelized designs. They charge $100 extra for panelized protopacks, so it's generally cheaper to place separate orders. Please note: Panelized designs are OK for 2 layer boards only! We only accept gerber files for 4 layer boards. We are unable to automatically process 4 layer Cadsoft Eagle .brd files at this time. 4 layer boards are made by a different manufacturer. They do not allow panelizing. You cannot combine rush service and color/ENIG for 4 layer boards. Generally the same as 4 layer boards. Generally the same as 2 layer boards. None of the board houses we work with have separate rules for flex or aluminum PCBs. Generally the same as 2 layer boards, but expect less as a general rule. None of the board houses we work with have separate rules for flex or aluminum PCBs. Generally the same as 4 layer boards. We work with a super high quality board house to make custom color boards, but we can't quote automatically. Expect a $500-$1000 setup fee on top of the PCB price, and additional fees for panelizing.